Enabling and configuring the Sandbox. In order to use the Sandbox, you must enable it in the Yandex.Direct interface, as described below. On the API settings page, go to the Sandbox tab. Click the link Launch sandbox. You will see a window for creating the Sandbox. Client — A normal Yandex.Direct client. Agency — An advertising agency (additional functionality is available for managing agency clients). Currency of the client or agency. Create test campaigns. If the option is selected, test data is created. For the “Client” role this creates three campaigns, and for the “Agency” role it creates three clients with three campaigns each. Client usernames are generated automatically. A certain amount of money is credited to one of the campaigns for each client. 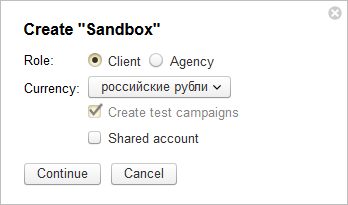 If you unchecked this option when creating the sandbox, you can create test data later in the Yandex.Direct interface (see below) or programmatically. Shared account. If this option is selected, a client is created with a shared account enabled. This option is not available for agencies. The Sandbox will be initialized, and the following elements will be displayed on the tab. The role selected in the Sandbox. Shared account: enabled or disabled. If you change the role, currency, or the shared account setting, data is deleted from the Sandbox. In order to change the currency or enable/disable the shared account, you must create the sandbox again. Click Stop using "Sandbox, then Launch sandbox. Master token. Used for accessing the finance methods in the Sandbox (see Accessing finance methods in the documentation for version 4 of the API). Create test campaigns. Deletes Sandbox data, then creates three campaigns for the “Client” role, or three clients with three campaigns each for the “Agency” role. A certain amount of money is credited to one of the campaigns for each client. Clear "Sandbox". Deletes Sandbox data. Reset transaction counter. Starts the numbering over for financial operations (see Accessing finance methods in the documentation for version 4 of the API). Stop using "Sandbox". Deletes Sandbox data and disables the Sandbox.